On Sunday, along with about 103.4 million other people, I tuned into the 2018 Super Bowl. 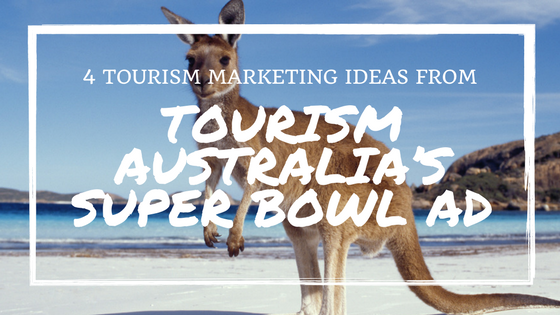 And while I found myself rooting for a certain (winning) team, I also found that I was cheering for another unlikely hero – Tourism Australia. That’s right, the tourism destination brought their A-game to this year’s big game with a commercial that competed with the Budweisers and Doritos of the world. And within that fantastic 1 minute and 30 second spot, I found myself considering four tourism marketing ideas that are good for any of us marketing a destination. 1. Use the unexpected to your advantage. In the first 50 or so seconds of the spot, you don’t even know you are watching a tourism ad. Cleverly disguised as a movie trailer, I was first wondering what comedic film Danny McBride was putting out next. But right around the 53 second mark, Chris Hemsworth mentions Australia’s “37,000 miles of pristine, beautiful beach” and I thought “that sounds like a tourism talking point.” Sure enough, that’s exactly what it turned out to be. The unexpected doesn’t have to come in the form of a million-dollar ad campaign. Your opportunity could be in the form of a niche asset, often overlooked or taken for granted, or by seeking out new channels to reach an untapped audience. It could even be as simple as a blog or an Instagram photo that catches people’s attention, and makes them wonder what else they don’t know about your destination. 2. Diversity is a good thing. Australia is known for the outback and its natural wildlife – crocodiles and kangaroos are practically part of their brand (a kangaroo literally appears in their logo). But those who have never visited may not have known about Australia’s amazing wines, pristine beaches, and gourmet dining options. I know I didn’t. Your destination may be known for one or two specific assets – like the Finger Lakes is known for water and wine. But it is the diversity of a destination – extras like the ability to try a craft beer, visit a world-class museum, hike past a waterfall, or stay at a local B&B – that will peak new travelers’ attention, and keep past visitors coming back for more. 3. Consider a celebrity endorsement. Would I have paid as close attention to Australia’s commercial had Chris Hemsworth not appeared in the first 15 seconds? Maybe not. But, not every destination is going to have Chris Hemsworth acting as the face of their tourism campaign. And they don’t have to. Take Visit Syracuse’s “Official Home of Winter” campaign as a perfect example. The city wanted to promote off-season tourism, and ended up creating “Winter,” the season. The big blue guy quickly become a mini-celebrity in his own right. In 2017, Winter went from a not-so-loved season to a physical character embraced by locals and visitors alike, starring in his own video series, authoring blogs, and making appearances at popular downtown events. Similarly, in Rochester, NY, women’s rights activist Susan B. Anthony has been known to make appearances at events and work with the tourism department to help promote the area that she once called home. Your efforts don’t have to be grandiose. It could be as simple as finding a local tie to a well-known name, getting creative with your partnerships, or creating your own. 4. When in doubt – embrace the stereotype. Visit Australia didn’t shy away from its machete-wielding, leather-wearing, Crocodile Dundee stereotype. They embraced it, setting the first half of their tourism narrative against shots of their rugged terrain. Don’t get so caught up in being everything that you lose sight of what makes your destination special. There are travelers for every area out there – with diverse interests and needs and ideas for their ideal vacation. Our job as destination marketers is to find out how to reach the right people, in the right way. And sometimes, that’s just continuing to do what we, as the destination, do best. Whether it’s wine, water, or wild adventures- embrace it! Don’t forget those loyal travelers who love you for exactly who you are.